Walking out of the house in the perfect outfit can be a challenge sometimes. Sure, I’ve got a nice blouse, jeans that fit, and cute shoes, but what about the rest? Taking your outfit from cute to stunning is a process that many fashionistas love about each morning! Whether you’re out running a few simple errands or headed to work, there’s no excuse not to look amazing with very little effort! Try out these tips and see if you don’t feel the difference as well! With the weather getting colder, adding a cute hat is a wonderful way to stay warm and tie your outfit together! Wearing a hat can be tough on your hair, so if you want the comfort of a hat without the hassle of what lies underneath, pin your hat loosely in place with a few bobby pins instead! If you have matching arm warmers or leg warmers, this is the perfect time to wear all of these great accessories together! Grab our Cozy Cable Knit Hat while you still can! Feeling like your outfit is still missing something? Grab a tote with bold prints or a gorgeous color to add to your ensemble. This is an especially great choice if you are out running errands! And I have to say I’m a little partial, but I LOVE this Indian tote from the G&L collection! A trend that has taken the world by storm is easier to pull off than you might think! Nick-named “middle rings,” these small and simple rings sit just between the knuckles on the middle of your fingers. You can find them at most boutiques, but it also works to buy rings a few sizes too small and fit them over your first knuckles. This style is great for adding glam to your routine, and this trend is the easiest way to pull it off! 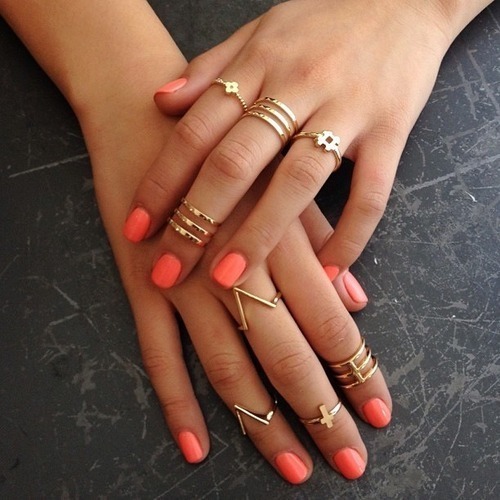 Pair these cute rings with a chunky watch or a few bracelets to bring everything together. Choosing a bold necklace can help bring your outfit together in one of the easiest ways possible! You don’t have to adjust it throughout the day or take it off in case it gets too hot, and it won’t get in the way of anything you’re doing. When it comes to a statement piece like this, there is no wrong answer! A trendy scarf is my #1 favorite way to accessorize an outfit. A soft lace knit scarf can take you from a chic daytime fashionista to a fun and whimsical evening look that that will help you to fend off that chilled night air! My favorite? I love a faux fur scarf to transition from fall to winter! Find this scarf here! Accessorizing your outfit is the best way to re-use old items and still feel like you’ve created something new! Recycle those older pieces and stay trendy at all times! 5 Gifts Your Husband (Actually) Wants For Father’s Day!